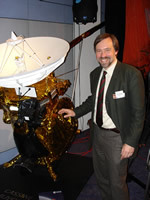 Prof. Dr. Schilling worked in space industry on design of interplanetary satellites (including HUYGENS to the Saturnian Moon Titan and ROSETTA for cometary exploration) before he became Ordinarius Informatics VII: Robotics and Telematics at University Würzburg. In parallel he is president of the company "Zentrum für Telematik e.V.". He received 2012 an Advanced Grant from the European Research Council for networked satellites system control and was recipient of the Walter-Reis-Award for Innovations in Robotics 2008 and 2012. He is corresponding member of the International Academy of Astronautics. At Stanford University he was Consulting Professor 2002-2006. In the International Federation on Automatic Control (IFAC) he serves since 2008 as Chairman of "Technical Committee on Telematics" and at IEEE was appointed 2006 - 2012 as chairman of the "Technical Committee on Networked Robotics".